Watching a baby grow into a walking talking toddler is truly a delight for parents. And helping them achieve these milestones is a treasured memory. Walking is a major achievement for toddlers, and we want your little one to have as much fun learning to walk as you have watching them learn. Here is a list of the best toddler push toys in 2019 that you can surprise your toddler, niece, or nephew with. How Can Push Toys Teach Toddlers To Walk? When babies are learning to walk, they are putting all their energy into the effort, and often lose balance. At this stage, it is highly recommended to avoid the use of push toys as that can result in irregular walking patterns. But once they are a toddler and get steady on their feet, there is absolutely no reason to keep them from fun push toys that will motivate them to exercise those little legs. Push toys come in a wide variety. They offer additional balance to toddlers to help them master walking. Many have flashy buttons that produce interesting sounds or poems, and these make toddler push toys educational as well. With such interactive activity centers, sounds, and bright colors, your toddler is going to have a blast pushing around their push toys. However, adult supervision is highly recommended at all times. Toddlers do get a little independent with each milestone they achieve, but you still need to keep a watch on them, so that they don’t end up walking towards the stairs, or any other such dangerous place. Little ones are very quick at learning, and moving around a push toy is a piece of cake. Just help your toddler put their hands on the bar or handle while standing, and push the toy. Within no time, you will see your little one walking around the house. They are eager to help you out, and with their favorite push toy now, they are going to do all your little chores. Let’s dive into the best toddler push toys in 2019, some of which are bound to become your toddler’s favorite. 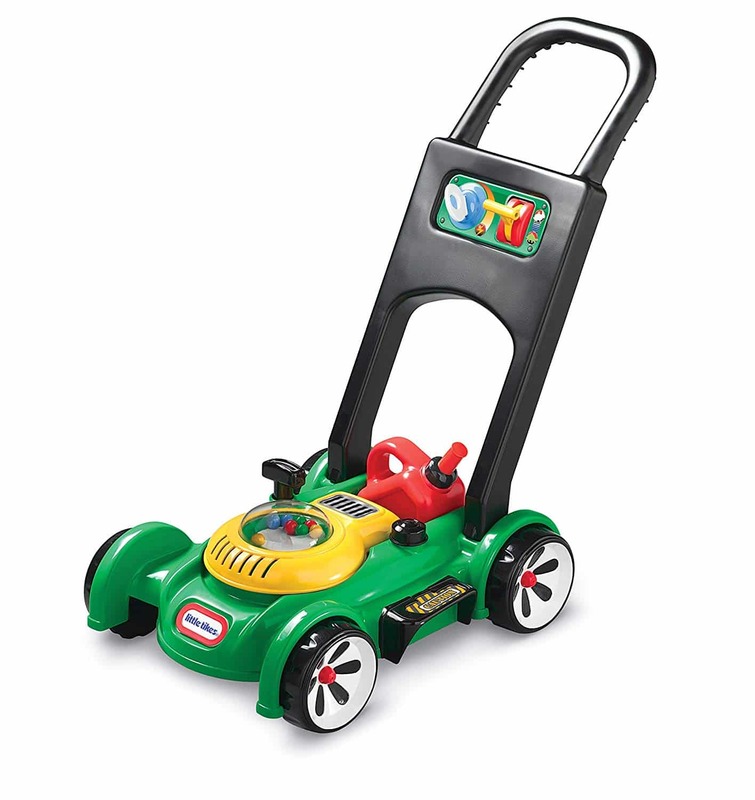 Little Tikes Gas ‘n Go Mower is our top pick for the year. Toddlers learn from their surroundings, and they absolutely love doing what adults do. With this little mower, they can now help out to their heart’s content during gardening sessions, while learning to walk better. This toy mower features popping beads that make a popping sound when it’s pushed. What’s even better is that it requires no batteries at all, because the sound is produced mechanically. 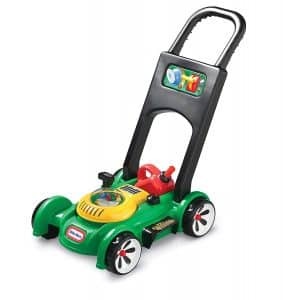 Kids will feel like they are using an actual mower, because it even sounds like an engine when the cord on it is pulled. What’s more? It has a removable gas can to make the experience as realistic for children as possible. While the no-batteries feature is awesome on one hand, it can get pretty annoying because children enjoy noise, and there is no way of stopping all those sounds. With battery operated toys, you can just take out the batteries or push an off button to have some peace of mind, or ears in this case. The lawn mower is very easy to assemble; there is just one bar that needs to be snapped in place. It can easily be removed though, in case you need to pack it up. It comes in two different types of packaging: the regular one is really packed and getting the mower out takes quite a bit of time, whereas the frustration-free is uncomplicated and is good to go in no time. A vacuum cleaner is a terrifying machine for some kids while for others, there is nothing better in the world. This is where Dyson Ball Vacuum steps in to make your kid happy and excited about clean up time. It is an excellent replica of the original machine, and features real suction that can pick up paper and polystyrene balls. It is an ideal toy to help clean up, especially after an art activity that results in a ton of small pieces of paper. It can twist and turn, just like an actual vacuum cleaner. It has a clear cylinder with colorful balls whizzing around when it’s on. It also features a small removable drawer for debris. It requires four C batteries that you will have to buy separate. Not only is this fun for kids, it also teaches them the importance of cleaning up, and gets them in the habit. Although the manufacturer has stated 3 years+ as the ideal age, this toy vacuum cleaner is a favorite even among 1 year olds. As long as they can walk, they should have no problem maneuvering the Dyson Ball Vacuum, and helping you clean up their mess. 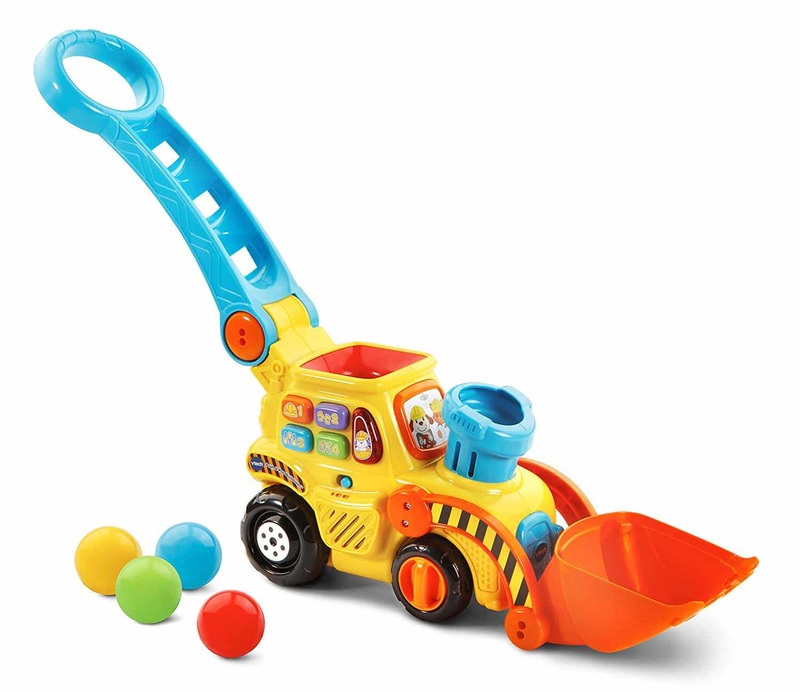 Pop-a-balls push and pop bulldozer by VTech is a fun push toy for toddlers who are fascinated with construction vehicles. This brightly colored toy is packed with buttons and sounds that is sure to engage your little one, and have them develop their motor skills. This bulldozer really encourages kids to exercise their legs because balls pop out of its chimney into the bucket and that excites them. Moreover, the various buttons on the bulldozer produce sounds that teach toddlers about colors, numbers, and other phrases to help them in language development. Toddlers will be pretty busy with this push toy as they gather the balls and put them back in the bulldozer for some more fun. And when play time is over, the balls can be neatly stored inside. This bulldozer serves to engage kids whether they are walking or sitting. Its variety of buttons will keep them busy even if they just sit and play with the toy. It requires 3 AAA batteries, and good news is that they are included in the package. That sure keeps you from the hassle of getting them separately! The handle on the bulldozer can be moved up and down which makes this push toy appropriate for ages 1 to 5. 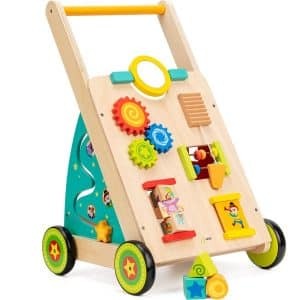 Although a little on the expensive side, Cossy has some wonderful wooden baby walkers that are brightly colored, and full of interesting activities for toddlers. And almost all have at least a four star rating on Amazon, so you can rest assured that they are among the best push toys for toddlers. One version has a wooden sloping wall on which there is a variety of pieces to play with, including shape sorters, animal blocks, and a maze. Such activities inspire children to dig in to their imagination and get creative. Other versions of Cossy’s wooden baby walkers include themed carts with wooden blocks, including frog, fox, and forest. But that’s not all, Cossy has even more different versions of push toys to suit the different choices of each kid. All its baby walkers have rubber-trimmed wheels so there’s no damage to the floor, so that’s a great feature because toddlers can get pretty aggressive. Non-toxic paint is used on the pieces so it’s not dangerous for kids. 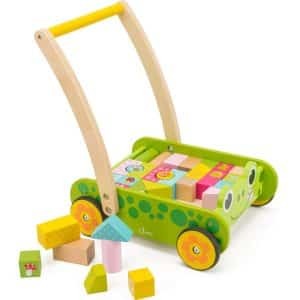 Moreover, the blocks are big so this push toy is appropriate for babies as young as 1 year, so long as they are steady walkers. Some customers might receive a squeaky cart, but Cossy has an amazing customer service and will definitely resolve the issue for you. 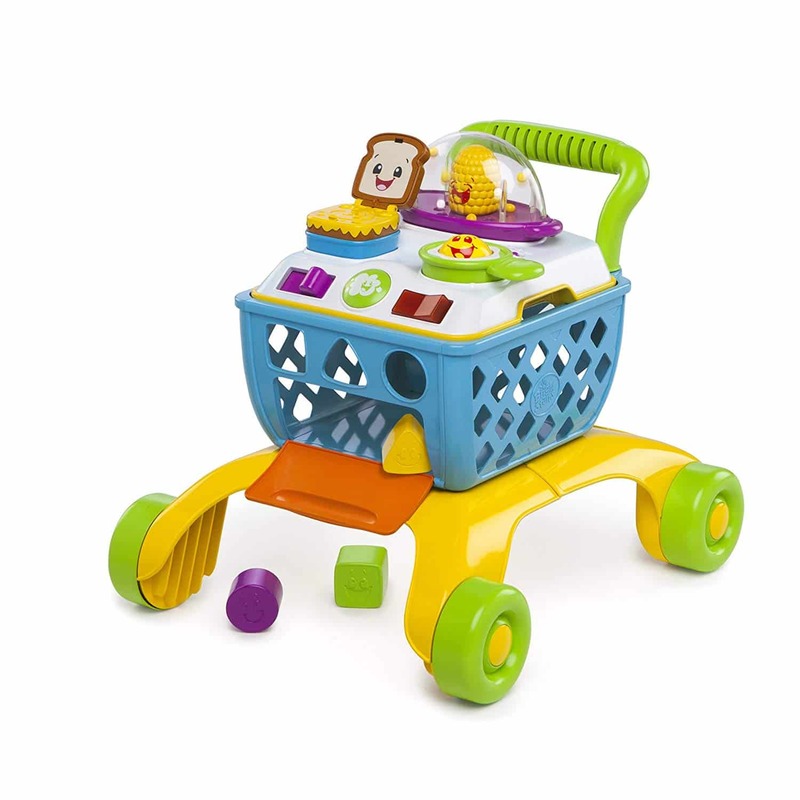 This walker by Bright Starts is quite a popular toy because no one is as excited about grocery shopping as kids, and this Gourmet Shop ‘n Cook Walker serves the purpose just right. It has a high rating on Amazon, and for good reason; it lets kids feel as if they are actually grocery shopping. There are different ways to play with this walker. It has a removable cook top so kids can play with it while sitting. They can even stand and play on the cook top. They can push and pull the cart, and they can remove the cook top to put their shopping in. And we are sure kids will find a ton of other different ways to play with this colorful push toy. When the cart is pushed, the popcorn actually pops. It has sizzling sounds, a sunny side up egg roller, and shape sorters. It even has a popping sandwich. This is such a versatile toy that it is appropriate for a wide range of ages. It operates on 3 AA batteries, and they are included. The cart has a wide base so it offers sufficient support and balance to keep your kids from falling. The wheels can even be locked so the cart stays in place, in case your child just wants to play with the cook top instead of pushing it around. By giving stimulating rewards, push toys are a great way to motivate toddlers to use those little legs. With so many interactive buttons, kids learn a lot of vocabulary, and are happily engaged, giving parents some time off. Let's look at the best toddler push toys in 2019 to help teach your child to walk. Some of these walkers are bound to become your toddler's favorite. I am speech and language pathologist.